Gather your young ghouls in the kitchen and let them get stuck into this delicious cupcake recipe! Recommended by Natasha White, our friendly HR & Entertainment Coordinator, who in-house is also known as a very talented baker – often baking delicious cupcakes for office staff members on their birthdays. Gently split the Oreo in half. Place a very small spoonful of orange frosting in the centre of the Oreo cookie. Place a Hershey’s kiss on top and press down. Add some sprinkles. Set aside. Pipe the green frosting into the centre of the cupcake and wind it gently up into a few layers. 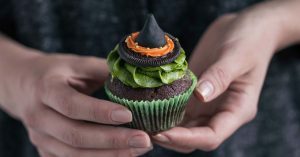 Place an Oreo witch’s hat on top. Refrigerate cupcakes (covered) until ready to serve.